Roundtable 113 marked a return to Broad Ripple's Barley Island Restaurant and Brewhouse for part of their ongoing guest brewery series of events. The guest brewery this time out was St. Louis' Schlafly - long time friends of Hoosier Beer Geek. 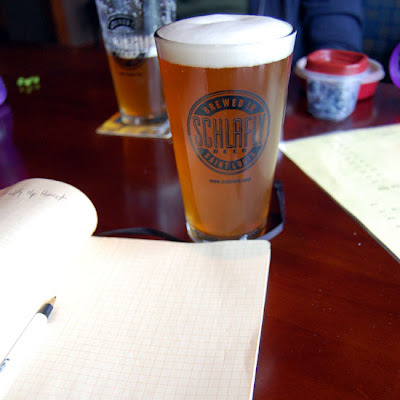 We roundtabled two Schlafly beers - Schlafly Hop Harvest and Schlafly Pumpkin. If you've followed HBG for a while now, you might have noticed that this isn't the first time we've drunk Schlafly pumpkin. It is, however, the first time we've assigned it a mug score. 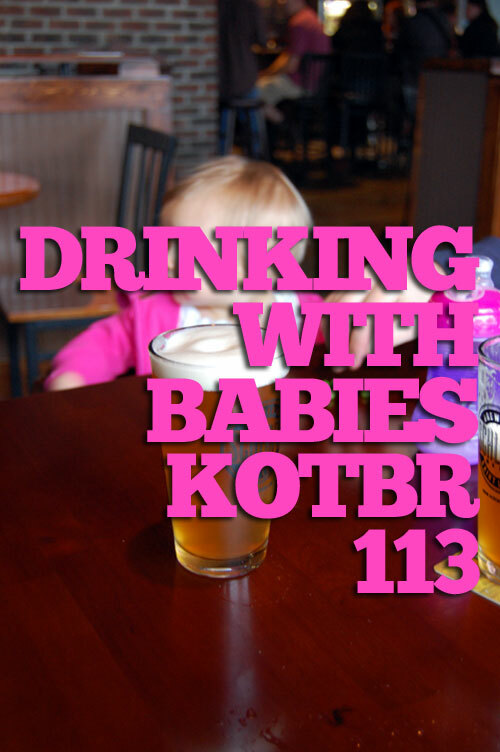 KOTBR #113 also marks the first time we've ever drank in front of a baby whose father later missed the deadline for turning in his reviews. Luckily we caught the highly elusive baby on film, and will count that as a contribution from the father. This time. Chris. Schlafly Hop Harvest - I'm sure I'm not alone in saying that this beer was not at all what I expected. I anticipated a floral hop explosion, but instead got a relatively mild beer in comparison to other wet hop ales. For me, the predominate note in this beer was a sweet, funky apple character with a moderate hop bite. In fact, Hop Harvest kind of reminded me of a Belgian blond ale. But even though Hop Harvest was not like other wet hop ales, it was a good enough that I'd certainly buy it again. 3.60 Mugs. Schlafly Pumpkin Ale - Okay . . . I'm going to trot out the old cliché here, but it's the best I can do because it is the best description for the beer -- Schlafly Pumpkin Ale is literally like having pumpkin pie in liquid form. Indeed, for me, no other pumpkin ale I've had captures a true pumpkin pie flavor as does Schlafly Pumpkin Ale. It's all there in the beer: pumpkin, brown sugar, nutmeg, clove, and cinnamon. Schlafly, however, ups the ante with the addition of butternut squash. Rich, sweet, malty -- I love this beer, and I don't typically like pumpkin ales. Perfection . . . 5.00 Mugs. Schlafly Hop Harvest - This beer is certainly not your typical... okay, this beer is anything but typical. With a name like Hop Harvest, I was expecting something big and hoppy. That's not exactly what I got. I was welcomed with aromas of oranges and herbal hops, leading me to believe my assumptions were correct. What followed up was the combination of many typical hop flavors such as lemon, grapefruit and spruce, but everything was combined in a heavy, yeasty body. Something that walked the line between IPA and Hefeweizen. This was certainly an interesting beer, but in the end I was left wishing this beer knew what it was, or at least I knew what it was. 3.2 mugs. 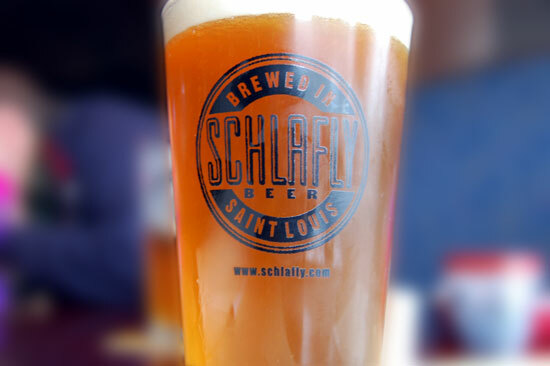 Schlafly Pumpkin Ale - Pumpkin ales come in two varieties: spice and vegetable. On one end of the spectrum you have the sweet, squash-like flavor of pumpkin. On the other end, you have huge spice notes of allspice, nutmeg, cinnamon, cloves and ginger. Brewers typically aim for some balance between the two. I'll admit that I'm typically not a fan of the pumpkin ales that are too much spice and not enough pumpkin, but Schlafly somehow pulls it off perfectly. Up front this beer this beer smells like chai, cinnamon and anise. The beer itself is very spicy, with all of the typical pumpkin spices, plus muscavado sugar (think gingerbread) and pumpkin. Literally like a pumpkin pie. Despite how spicy it is, I can't think of anything I would do to change this beer. 3.8 mugs. Schlafly Hop Harvest - This was the shocker of the evening, not giving me what I wanted but not yet a disappointment. This was a lightly hopped beer with lots of oranges and pine notes in the nose. The flavor was more of a saison without all the coriander flavor and just a little funk to it. I was surprised that there wouldn't be more of a hop kick in the flavor and also found myself a little disappointed that something that smelled big only tasted like a farmhouse ale. 3.48 Mugs. Schlafly Pumpkin Ale - I love that this was served in a fancy tulip glass; finally, a pumpkin ale that isn't about getting hosed, right? Wrong - this is one big pumpkin ale at 8% ABV and is a huge spice bomb. It balances out with a nice sweet, squash flavor and makes me want to dollop on the whipped cream. I get lots of ginger, chai and brown sugar notes in this decadent ale. I would recommend this to be brought to the family Thanksgiving and to be paired with either sweet potato or pumpkin pie. It also would be perfect to make a beer float out of! 4.20 Mugs. I am completely smitten with this beer. Every year it comes out I can't wait to try it and when I do I want to drink my weight in it. 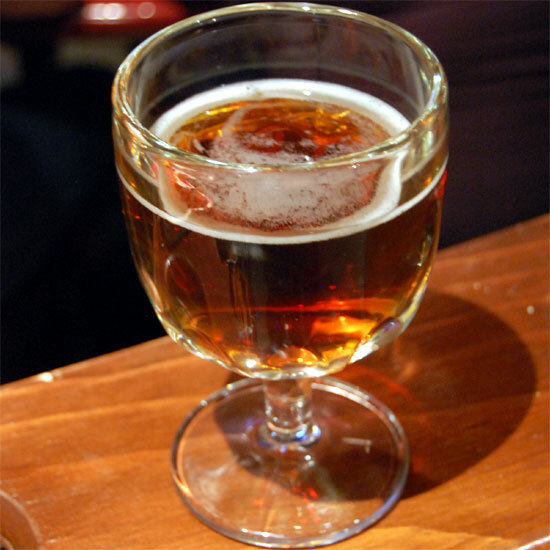 And since it is only around a short amount of time and it is around 8% abv, I never feel like I get my fill. This beer is solely responsible for turning my pumpkin beer frown upside down. What I love most about this beer is the combination of spicy flavors and full mouthfeel. I agree with Jim's sentiment that it is truly like pumpkin pie in a glass, that is undoubtedly true. 5 Mugs. No time for more, I've got diapers to change. I am completely smitten with Gina! Marie - Thanks! The feeling is mutual. Fenris - exactly. Scoring is tricky sometimes for that exact reason. Fenris - the scoring is completely arbitrary - it's only a measure of how much we liked the beer at that particular time when we were drinking it, not anything else. So if we were having a good night, there's a very good chance that the score is going to be higher. And each of us has our own scale, as well, so that further complicates things. Some of us have a small list of 5 mug beers, some of us (Rod) refuse to believe that anything deserves five mugs because there's always room for improvement. If you're a regular reader, we hope you might find that your thoughts on beer align themselves with someone who writes here, so that you might say "well I generally agree with what (whoever) says, so I should probably check this one out." Hopefully in reading the reviews our logic for scoring comes through. That we'll admit that's not always the case. I am just glad that Chris didn't get diapers in either of his beers. Also I don't know if I've given a 5 mug rating yet either. Silly New Kids on the Blog.